Motto: "Open Spaces and Familiar Faces"
The City of Durango is the Home Rule Municipality that is the county seat and the most populous municipality of La Plata County, Colorado, United States. The United States Census Bureau reported a population of 16,887 in the 2010 census. The town was organized in September 1881 by the Denver and Rio Grande Railroad (D&RG) to serve the San Juan mining district. The D&RG chose a site south of Animas City for its depot after Animas City refused to pay a dowry to the D&RG. The city is named after Durango, Mexico, which was named after Durango, Spain. The word Durango originates from the Basque word "urango" meaning "water town". Durango is located at at an elevation of 6,512 ft (1,988 m). According to the United States Census Bureau, the city has a total area of 6.8 square miles (18 km2). According to the Köppen climate classification system, Durango has a warm-summer, humid continental climate (Dfb). The average annual precipitation is 19.33 in (491 mm). Its hardiness zone is 5b. In the city, 16.6% of residents are under the age of 18, 26.1% from 18 to 24, 27.2% from 25 to 44, 19.4% from 45 to 64, and 10.7% who are 65 years of age or older. The median age is 29 years. For every 100 females there are 104.1 males. For every 100 females age 18 and over, there are 103.8 males. The median income for a household in the city is $34,892, and the median income for a family is $50,814. Males have a median income of $31,812 versus $25,022 for females. The per capita income for the city is $19,352. 17.2% of the population and 7.3% of families live below the poverty line. 11.2% of those younger than 18 and 8.9% of those 65 and older live below the poverty line. Durango is nestled in the Animas River Valley surrounded by the San Juan Mountains. The Animas River—El Río de las Animas (River of Souls)—runs through downtown and boasts gold medal fly fishing waters, and is popular for whitewater rafting, kayaking and canoeing. Durango is also popular for outdoor activities like hiking, mountain biking, road biking, backpacking, slacklining, rock climbing, hunting, off-roading, year-round fishing, and golfing. Durango is near five major ski areas, including Purgatory at Durango Mountain Resort, located twenty-five minutes north of downtown. The city is located thirty-five miles west of Mesa Verde National Park, a UNESCO World Heritage Site best known for its Ancestral Puebloans cliff dwellings. The annual Durango Ragtime & Early Jazz Festival features noted musicians from around the country. 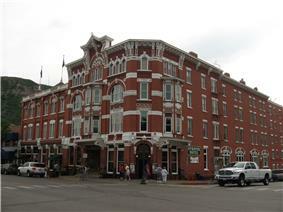 It is held in the Strater Hotel, a historic Victorian hotel in Durango. Durango is most known for the Durango & Silverton Narrow Gauge Railroad, a heritage railway, which travels from Durango to the historic mining town of Silverton, Colorado on steam-powered trains with rolling stock dating back to the 1920s and before. Durango hosted the first-ever Mountain Bike World Championships in 1990. Durango is home to the Snowdown Festival, an event that has a new original theme each year, and includes a single firework to start off the ever popular light parade. The parade is the centerpiece and usually occurs the last Friday of January or the first Friday of February. Many local businesses hold competitions throughout the week, including a beard growing contest, joke off, hot wing eating contest, beer plunge, outhouse stuffing and many others. Main Avenue cuts through Downtown Durango, home to clothing boutiques, restaurants, newsstands, tourist and gift shops, a mall, bars, lounges and other businesses. Many buildings downtown are several stories high and include apartments in the upper levels. Durango's two oldest hotels, The General Palmer and The Strater Hotel, are both at the South end of Main Avenue, one and two blocks away from the train station, respectively. It is also home to many restaurants. Durango actually has more restaurants per capita than Denver. Many serve specialty foods including Mexican, Italian, French, Thai and Japanese and others serve American favorites. Main Avenue is walked by thousands of tourists each week, making it the most popular shopping and relaxing tourist destination in Durango. Durango has a number of media outlets, including The Durango Herald, 99x Durango, XRock 105.3, and many others. DRGW steam locomotive on the Durango turntable, 1965. Durango is served by U.S. Highway 160 (the Old Spanish Trail), running east-west and U.S. Highway 550, running to the north and south. Part of U.S. 550 offers high-speed access (primarily a 4-lane, divided highway) to Albuquerque, New Mexico. North of Durango, 550 is nicknamed the Million Dollar Highway, and is part of the scenic San Juan Skyway. Durango is served by a major regional airport for southwestern Colorado — Durango-La Plata Regional Airport (actually located near Ignacio). Durango-La Plata County Airport (IATA code: DRO) is serviced seasonally by Frontier Airlines, and serviced year-round by regional carriers SkyWest Airlines (United Express), Republic Airways (United Express), Expressjet Airlines (United Express), SkyWest Airlines (US Airways Express), and American Eagle (Envoy Air). As of 2014, regional connecting hubs to DRO include Dallas/Fort Worth International Airport (DFW), Phoenix Sky Harbor International Airport (PHX), and Denver International Airport (DEN). Durango Transit provides several loop bus routes that serve the community, including Fort Lewis College. Normal hours of operation are M-F from 6:30 am to 6:30 pm. Ignacio Road Runner provides bus service to the nearby towns of Ignacio and Bayfield with four trips daily on weekdays and one on Saturdays. Both services share the new Durango Transit Center (opened August 2010) as a hub. Greyhound Bus Lines formerly served Durango, but following budget cuts the service was discontinued. As of 15 July 2014, Road Runner Transit (a service of Southern Ute Community Action Programs) has restored daily bus service between Grand Junction and Durango. Durango is served by the Durango and Silverton Narrow Gauge Railroad. Durango has a regional shopping center (Durango Mall) as well as a Wal-Mart, Home Depot, Pier 1 Imports, Office Depot, Bed Bath & Beyond, TJ Maxx, Sports Authority and Big 5 Sporting Goods store. 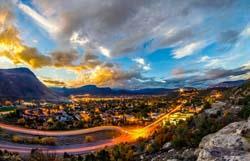 Fort Lewis College is situated on a 350 foot (110 m) mesa (bluff) overlooking downtown Durango, and is accredited by the Higher Learning Commission of the North Central Association of Colleges and Schools. As of 2014, some 4,028 students are enrolled at FLC. FLC is considered a public, 4-year liberal arts college. Southwest Colorado Community College, a branch of Pueblo Community College, is located in the Central Business District, on Camino del Rio. 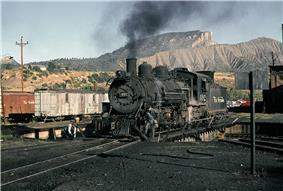 Much of the 1953 western movie The Naked Spur starring James Stewart was shot in Durango. In 1965, Rosemary DeCamp played Durango newspaper editor Caroline Romney in the episode, "Mrs. Romney and the Outlaws" of the syndicated television series, Death Valley Days. In the story line, Romney sounds the alarm for citizens to fight the Kimball/Sykes gang. Willard Sage played Marshal Christy. Parts of the 1969 film Butch Cassidy and the Sundance Kid were filmed north of town along the Animas River. Part of the 1991 film City Slickers was shot in Durango. The 1999 movie Durango Kids describes a time tunnel in the old mines outside of Durango. Parts of the 1993 film "Cliffhanger" were shot in Durango. ^ a b c "Current City Council". City of Durango. ^ "Current City Council". City of Durango. ^ "Mrs. Romney and the Outlaws". ^ Durango KidsIMDB: , motion picture.